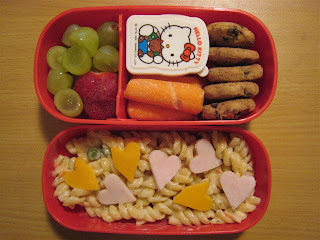 BentoLunch.net - What's for lunch at our house: Back to lunch Monday! We're back! My parents were here for Faith's birthday, so except for the two full school days (Monday/Wednesday), we haven't been bento-ing. Friday, we picked her up earlier than normal to have one last lunch as my parents left Saturday morning. But back to today's lunch. We're sick of quiches, we're out of bourek, I didn't feel like making sandwiches and strombolis were more work than I wanted to do last night. So I made a quick batch of pasta salad for F&B which is always a hit. 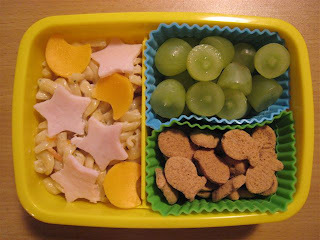 Ben has pasta salad with turkey stars and cheese moons, grapes and cinnamon Goldfish. The box is a really cute Elmo one that I always forget we have, but it works perfect for this. Awww, I want a 2 tier box for Abby... she's LOVE IT! Where can I get one?